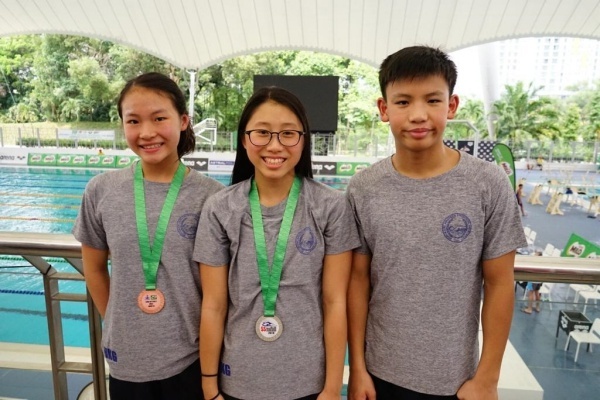 Three SCA/Harry Wright International swimmers where selected by the Hong Kong Amateur Swimming Association to represent Hong Kong at the Malaysian Age Group Championships. The other two gold Medals were achieved with Team Hong Kong’s 4 x 100 m IM and 4 x 100 m Freestyle Relays. Sarah also brought back two Silver Medals. She was awarded those in the 400 m Freestyle in 4:37.67 and the 50 m Backstroke in a time of 31.55. Peony Lee (11 yrs.) was our youngest swimmer representing Hong Kong. She won a Gold medal on the Hong Kong 4 x 100 m Freestyle relay. Further she achieved two Bronze Medal finishes in the 100 m butterfly in 1:08.45 as well as the 50 m Butterfly in 30.57. Jody Lee (12 yrs.) won a Gold Medal with Hong Kong’s 4 x 100 m IM relay. He ranked second in the 200 m Butterfly in 2:24.02. Further he was awarded the Bronze Medal in the 50 m Butterfly in his age group in a time of 28.36. A big congratulations goes out to all three swimmers on their stellar performances in Malaysia with the Hong Kong Team! Please note that all three swimmers competed in many more events and ranked in all among the “Top 8”in their age Group.